Actually, Taiwan has its own local equivalent to olive oil: sesame oil. Very good quality sesame oils have been used for cooking delicious and healthy food for hundreds of years in Taiwan and other countries in the region. These include extra virgin cold pressed white sesame oil, extra virgin roasted white sesame oil, and extra virgin roasted black sesame oil. Sesame oils have all the good qualities that olive oil offers, but the fragrance is different. If you are making Taiwanese, Chinese, or Asian cuisine, a good bottle of sesame oil is essential. Here are some tips to help you choose and use sesame oils correctly. Generally, sesame oil contains lots of Vitamin E, which is very good for protecting us from heart disease, and moisturizing skin. Its lecithin helps promote the growth of healthy hair, the fiber is good for improving digestion, and its high calcium content is even good for the health of women who are breast-feeding babies. Pressed sesame oil also contains a rich proportion of unsaturated fats (including about 40 percent linoleic acid), vitamin E, amino acid, and minerals. The effectiveness of sesame seeds is even further enhanced when they are ground up into a powder. In ancient Chinese tradition, sesame oil is called “long life oil”, because it was believed to have anti-aging effects. There are three main types of sesame oils: Extra-virgin roasted white sesame oil, extra-virgin cold pressed white sesame oil, and extra-virgin roasted black sesame oil. Extra virgin roasted white sesame oil is the sesame oil most people in the West are familiar with. White sesame seeds are roasted, and then pressed by machine. The oil is usually use for making dressings or sauces, mainly for cold dishes. Because extra-virgin roasted white sesame oil is “warm” (according to Chinese food traditions), when making salads, or cold dishes, Taiwanese people like to add the oil to balance this with a warming effect. If you want to use it on hot dishes, you can only add it to the hot dish at the last minute, and then quickly turn off the heat. This oil doesn't take the heat well; the fragrance disappears when the oil is exposed to high heat. Many of the sesame oils on the market are blended with other oils like soya oil. This is a way to make it cheaper, similar to the way that cheaper olive oils are produced. Of course this blended oil taste and smells much less fragrant and will not provide all the nutrition the pure sesame oil can offer. The method of producing extra virgin cold pressed white sesame oil is similar to extra virgin cold pressed olive oil, but using raw sesame seeds. It's not commonly seen in the stores because of its high price. Only a relatively small quantity is produced, compared to other cooking oils such as soy oil or sun flower oil. This cold-pressed sesame oil is made from raw white sesame seed, the color is clear and smoking point is 177°C. The cold press production process preserves most of the nutritional benefit of sesame seeds, because the process of heating up sesame seeds usually reduces their nutritional value. This oil can be used like any cooking oil, good for salads, stir-fried, or even deep fried dishes. The same method is used for producing extra-virgin roasted black sesame oil, roasting the sesame seeds and pressing them with a machine. Taiwanese call this black sesame oil. The smoking point of this black sesame oil isn't high, so it's better to use lower heat to cook this oil. 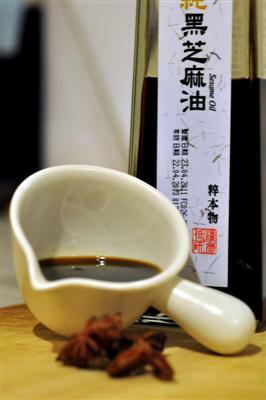 Black sesame oil is a very warming and tonic food, Taiwanese usually cook it for some very special reasons. People like to cook it with aged ginger in winter, for example. And black sesame oil chicken is a typical dish. Eating this style of cooking produces much energy, helping warm the cold body. This oil is also commonly used for postnatal women, the high energy sources help the mothers recovering from pregnancy and delivery, and the source of high calcium is good for breast feeding. Apart from these special periods for cooking with black sesame oil, people also use it when they are feeling a bit weak or trying to recover from illness or injury. Because it's such a tonic food, black sesame is very popular among vegetarians. You can also see lists of other articles and recipes on the site that involve sesame or black sesame.